How Long Can Fresh Salsa Be Left Out? Several factors affect the amount of time salsa can safely stay out -- temperature of your refrigerator and of the room, to name a couple. With a little planning, you can do some things to keep your salsa safe while it sits out and lessen the risk of a foodborne illness outbreak. Always keep your fresh salsa in the refrigerator until the last possible minute before serving. Once you pull it out of the refrigerator, it can safely stay out for up to 2 hours, says Magdalena Kendall, a surveillance epidemiologist with the Centers for Disease Control and Prevention. However, that amount of time only applies if the temperature of the room -- or outdoor area -- is less than 90 degrees Fahrenheit. If your house is hotter than that, or if you’re enjoying your salsa outdoors on a steamy afternoon, it can only stay out for an hour at the most. Because fresh salsa doesn’t have preservatives, it is ideal breeding grounds for bacterial growth. Cold foods, like fresh salsa, need to be stored in a refrigerator that is kept at 40 F or less, according to the Food Safety and Inspection Service of the U.S. Department of Agriculture. Once food starts going above this temp, it reaches the temperature danger zone -- a temperature range that is optimal for bacteria to thrive in. The only way to protect your food is to keep it below 40 F, or to heat it to above 140 F. Salmonella, shigella and E. coli are just some of the most common types of bacteria that grow in room-temperature salsa. Each of these bacteria lead to gastrointestinal distress, with diarrhea being a leading symptom. In severe cases though, foodborne illnesses can be fatal, so you should see you physician at the first sign of a problem. Clearly, you don’t want to heat up your fresh salsa to get it out of the temperature danger zone, but you can help it stay as cold as possible while you have it out. Place an empty ceramic or glass serving bowl in the freezer the night before. When you’re ready to put the fresh salsa out, pour it into the freezing cold bowl. Don’t panic if you forget to chill your bowl ahead of time though. Simply pour your salsa into a small bowl and place it over a bigger bowl filled with ice. Stir the salsa regularly, with a clean spoon each time, to maintain a steady cool temperature throughout the mixture. Just to be on the safe side though, you should still stick to the one to two hour time limit of keeping salsa out, even if you do your best to keep it cool. By the end of your get-together, you may have some extra fresh salsa lingering around in the bowl. Because it was sitting out as a dip, it could be full of tiny food particles that further feed the diet of unwanted bacteria. Bacteria from dirty utensils -- from guests who double dip -- can also add to bacterial contamination. Rather than putting leftover salsa back in the fridge, protect yourself from foreign organisms and just throw it out. 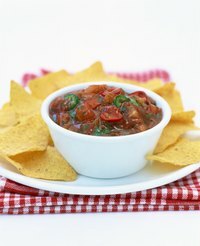 FoodSafety.gov: Salsa and Guacamole: Are They Safe? MayoClinic.com: How Long Can You Safely Keep Leftovers in the Refrigerator?